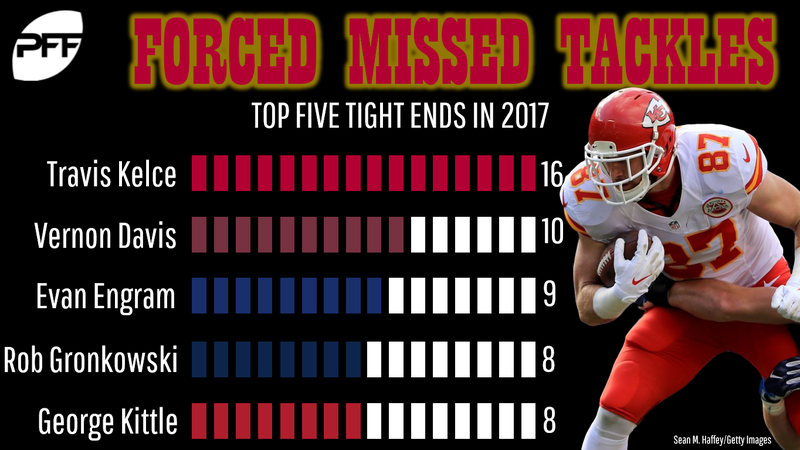 Travis Kelce led all tight ends in fantasy points in each of the past two seasons. I’m sure you’re aware of this, but did you know that over this stretch, he was also the most effective tight end at creating yards on his own? What do I mean by this? And how can I prove it? This page is initially sorted by raw PFF grade, with Rob Gronkowski first, followed by Hunter Henry, then Kelce, and then all other tight ends to play at least one offensive snap last season. Henry beat out Kelce in blocking grades, but Kelce was our second-highest-graded tight end via the pass last year. He also ranked first via the pass in 2016. After raw grades, we offer a number of different receiving metrics: targets, receptions, catch rate, receiving yards, yards per reception, yards after the catch, yards after the catch per reception, a receiver’s longest gain of the year, touchdowns, intercepted targets, dropped passes, missed tackles forced, and fumbles. Yards after the catch and missed tackles forced help to isolate a receiver’s production from that of his quarterback, focusing on what the receiver did with the ball in his hands. When we sort by yards after the catch, Kelce leads the group with 420, or 76 more than the second-closest tight end (Gronkowski). When we sort by missed tackles forced, Kelce leads with 16, or six more than the next-closest tight end (Vernon Davis). In 2016, Kelce led again in yards after contact with 652, or 240 more than the next-closest tight end (Martellus Bennett). He also ranked fourth in missed tackles forced (10). This isn’t new ground for Kelce, either. Kelce owns three of our top-10 tight end seasons this past decade in both yards after the catch and missed tackles forced, while no other tight end makes more than two appearances in the top-10 of either metric. Well, this suggests a few different things. Because Kelce is so productive and efficient on his own (with the ball in his hands), he might be safer than other tight ends changing quarterbacks this offseason. Quarterbacks likely have an influence on yards after the catch (by hitting a receiver in stride with accuracy), but Davis’ numbers with Alex Smith from when they were teammates the first time suggest this wasn’t the case with Kelce. Davis had just one year with Smith at quarterback where he posted top-40 all-decade numbers in yards after the catch, and he never reached the top-40 in missed tackles forced, though he’s been far more efficient on a per-reception-basis in Washington. There are other concerns for Kelce, however. Sammy Watkins joins Tyreek Hill as the primary wideouts in Kansas City. Throughout his career as an NFL head coach, Andy Reid’s WR1 has averaged 108.2 targets per season, his WR2 has averaged 80.0 targets per season, and his TE1 has averaged 80.3 targets per season. Last year, Kelce led the team in targets (122), followed by Hill (105), while Albert Wilson saw 62 targets in 13 games. Assuming Watkins is the clear upgrade over Wilson that the team thinks he is (Kansas City is paying Watkins twice as much as Miami is paying Wilson over the same period of time), this could mean less targets for Kelce. In college, Patrick Mahomes played in a Texas Tech offense that rarely ever targeted the tight end position. That said, Kelce leads all tight ends in yards gained from the slot over the past two seasons, so maybe this too matters less for him than it would most tight ends. At the same time, considering how readily Kansas City was to move on from Smith after a career year, as well as offseason comments of praise regarding Mahomes’ potential, perhaps Mahomes might even be beneficial for Kelce’s 2018 prospects. All of these concerns being raised, none of this changes the fact that Kelce is, in fact, really good, and Reid will continue to feed his really good tight end. Kelce currently sits behind Gronkowski as the No. 2 tight end in ADP, and just ahead of Philadelphia’s Zach Ertz. While I have these three in the same order, I do have them much more closely grouped together. While Ertz may be the better ADP value going a full round later, Kelce is still a strong value and safe pick in the middle of the third round of drafts.